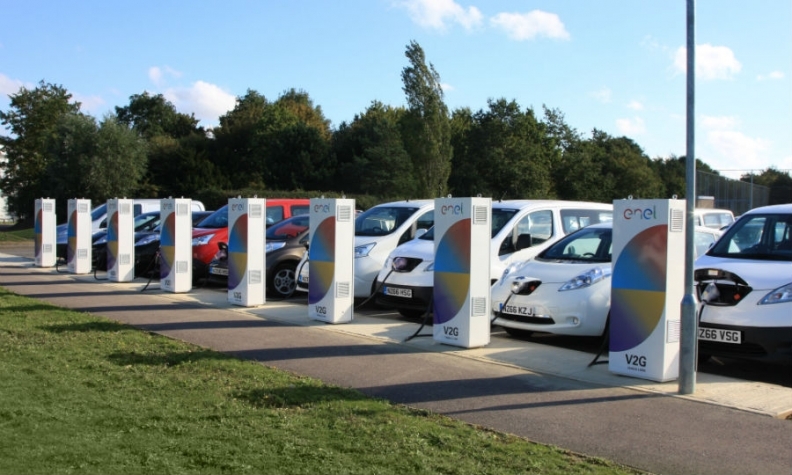 Nissan and Enel charge points enable EVs to give stored energy from the vehicle's battery back to the grid. LONDON -- Electric car owners are earning as much as $1,530 a year in Denmark, just by parking their vehicle and feeding excess power back into the grid. Trials in the country carried out by Nissan and Italy's biggest utility Enel showed how batteries inside electric cars could help balance supply and demand at peak times and provide a new revenue stream for those who own the vehicles. Technology linking vehicles to the grid marks another challenge for utilities already struggling to integrate wind and solar power into their distribution system. As the use of plug-in cars spreads, grid managers will have to pay closer attention to when motorists draw from the system and when they can smooth variable flows. "If you blindingly deploy in the market a massive number of electric cars without any visibility or control over the way they impact the electricity grid, you might create new problems," said Francisco Carranza, director of energy services at Nissan Europe, in an interview with Bloomberg New Energy Finance. While the Tokyo-based automaker has trials with more than 100 cars across Europe, only those in Denmark are able to earn money by feeding power back to into the grid. There, fleet operators collected about 1,300 euros ($1,530) a year using the two-way charge points, said Carranza. Restrictions on accessing the market in the UK means the company needs to reach about 150 cars before they can get paid for power sent back to the grid. That could be achieved by the end of this year, he said. Electric car demand globally is expected to soar, putting further pressure on grid operators to find new ways of balancing demand. Power consumption from vehicles will grow to 1,800 terawatt-hours in 2040 from just 6 terawatt-hours now, according to Bloomberg New Energy Finance.